Leah Larabell may have just had her first baby, but she’s been a mother for years. 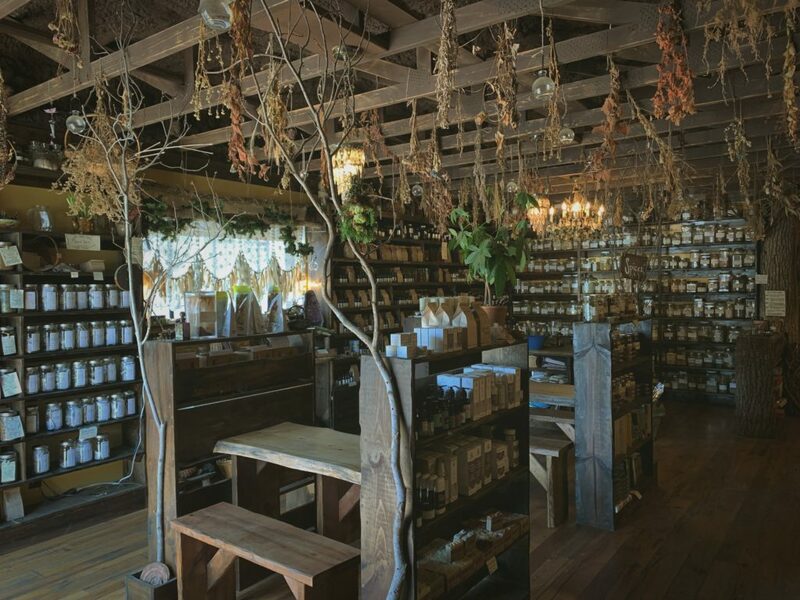 The creator of unique yet traditional tea blends and potions, a gardener of ancient herbs and the co-founder of High Garden Tea & Apothecary; her nurturing soul coaxes everything around her to blossom. High Garden’s beginnings are just as romantic as you’d hoped. 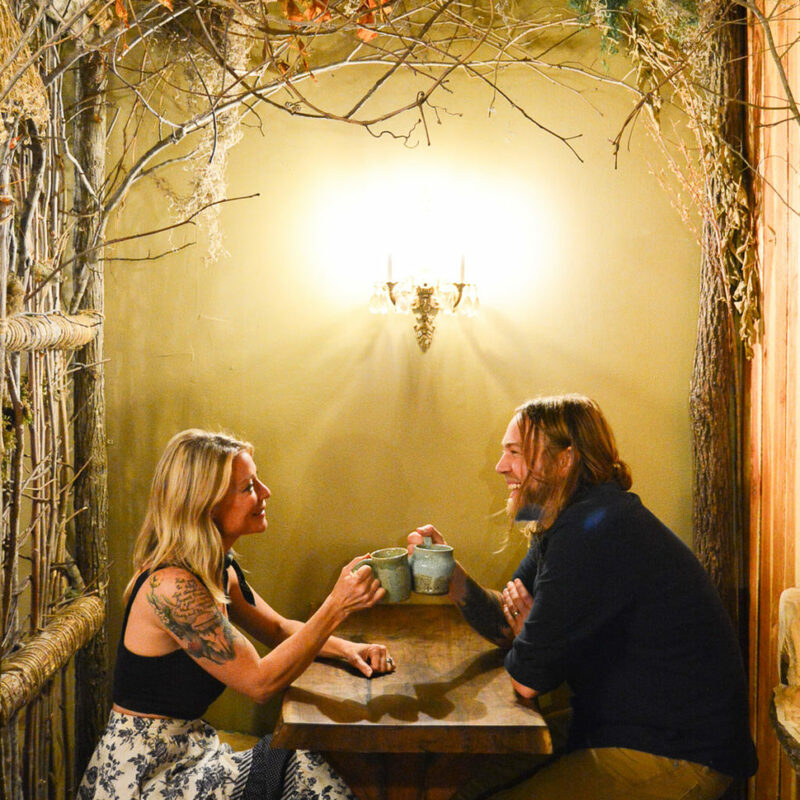 Instead of having a honeymoon, newlyweds, Leah and Joel, used their savings to open up shop. 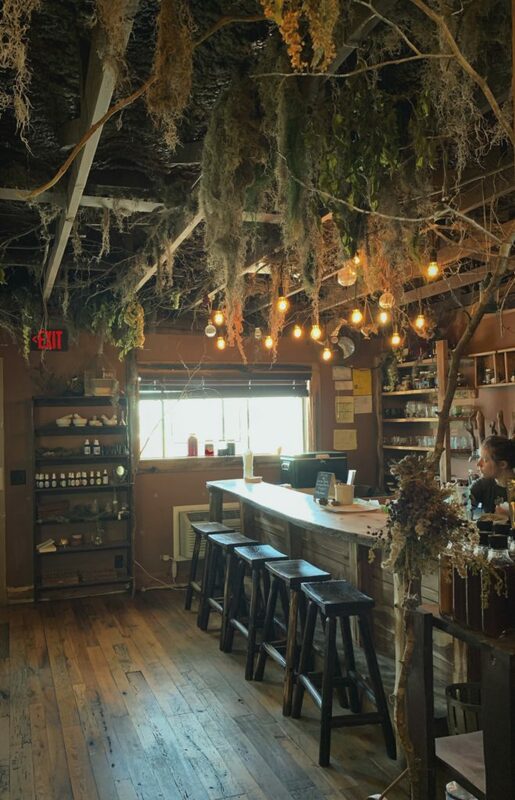 Her dream was to educate people on the magical qualities of herbs and plants, [quite literally] reconnecting them to their roots. Joel had a spiritual experience abroad with tea. He loved how seamlessly the sharing of tea transcended cross-cultural boundaries, and found a way to incorporate it into her vision. He built the entire store from the ground up and it has been their pride and joy ever since. 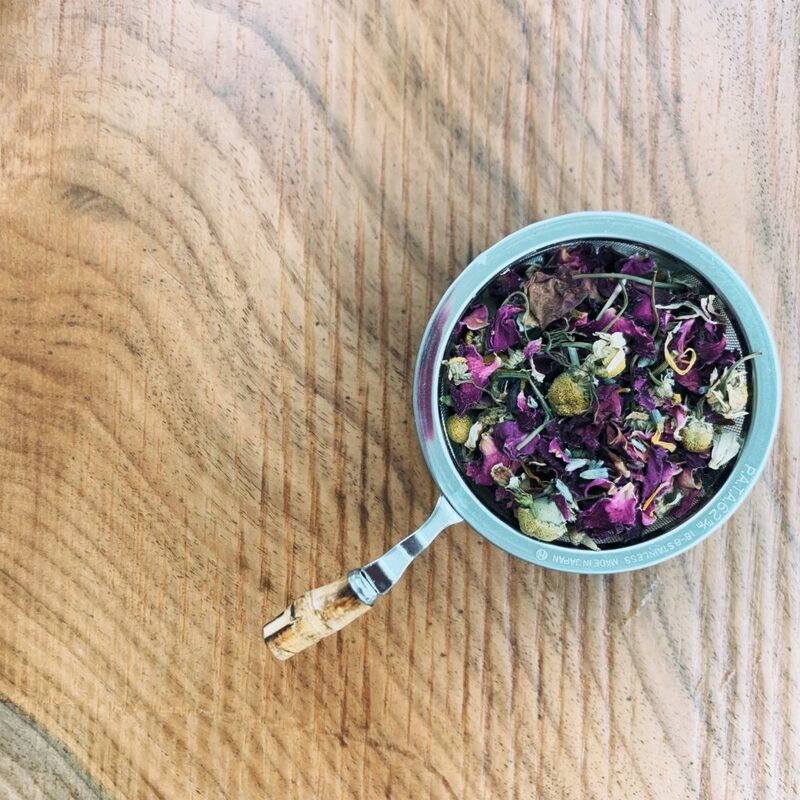 High Garden offers more than sixty hand-blended herbal infusion teas. Fifteen years of working with herbs has transformed Leah into the masterful expert we experience today. Plants are her friends. They are a part of her. “They are a part of us and we must treat them lovingly,” she explained plainly. She wants people to walk the earth with intention and appreciation for the surrounding greenery. “Don’t step on them. Don’t just yank them out of the ground. Know their names and speak to them kindly.” Not for nothing, her mixtures taste like they have been coddled and cooed from day one. The flavors are intense, complex, satisfying and above all, just darn good for you. The blends are either ‘tastefully healthy’ or ‘purposeful’. While both are overwhelmingly delicious, the purposeful blends (Calm, Get Well, Overworked) pack more of a punch in specific areas of the body or mind. When asked what she’s been brewing up post pregnancy, Leah was quick to say she hasn’t designed a special blend for herself, “I’m not too good for my tea. I don’t need to make something new. I believe in what I’m making. I just grab something off the shelf.” Right now she’s able to enjoy the ‘Tea for Two’ mommy blend, aiding in breast milk production, tummy issues and anything else a new mother might need. Leah’s affinity for the earth’s little green buddies posed an interesting dilemma when trying to source all natural ingredients. She will only work with farmers who are as passionate and attentive as she is, not using any additives, chemicals or harmful processes. While it has been a slow going process, she now has an extensive network of local growers. Anything she cannot source, she grows in her own garden. It was more difficult to find an all-natural tea carrier. Upon hearing their tea leaves come directly from a small family in China, it’s easy to envision Leah and Joel traveling abroad, gallivanting across the landscape with backpacks, holding hands, and embracing everyone they meet along the way. She laughed and said they were at home, on their 50thGoogle search page for ‘blooming tea’, when they found their guy. This little family operation has been growing tea in the same dirt for generations. The same way their ancestors did. They treat the soil with the utmost respect and are excited and adoring people. The same care, patience and love for the earth shines out of them the way it does Leah and Joel—a real match made in heaven. Refusing to compromise on their values and beliefs, resulted in an incredible relationship and unparalleled product quality. While there are heaps of things that make High Garden unique, the classes they offer are really something special. 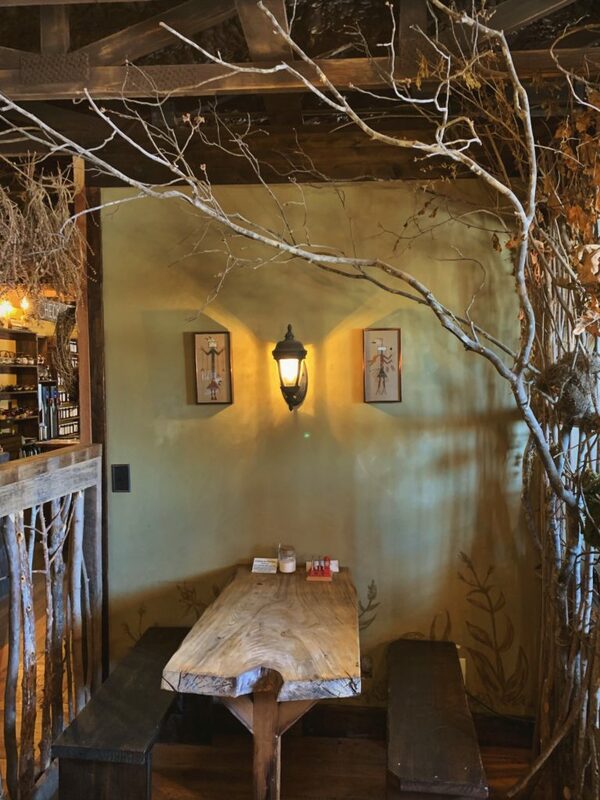 “They strike curiosity and remembering,” Leah gushes, “the classes re-introduce people to our natural selves.” The seminars teach a deeper understanding of the herbs and life around us. “Students will chop wood, carry water, drink Japanese tea over the fire. You just feel that pulling inside to go back to the earth,” she sighs. Some students become growers, while others might do something as simple as begin composting. One of Leah’s favorite moments was when a student came back to her after a hike and said they could actually recognize and name the plants around them. While she is currently taking a brief hiatus from High Garden, you can expect her bright, small but mighty self back at the shelves soon, happily mixing away.